Most years, I find whittling a best-of list down to just 10 entries a tortuous process. Not so in 2017, because in December 2016 I became a mother, and that brought with it a complete change in my video gaming habits. This year, I rediscovered how people play games when it’s not part of their job. And actually, I only played nine that made the cut. I have been a games journalist since I was 16 years old, which was… quite a long time ago at this point. I barely remember a time when video games weren’t just a passion of mine, but also a professional obligation. I’m supposed to be an expert on video games, so I play a lot of them—even ones I’m not massively interested in, so that I can have an informed opinion. Over the years, it’s gotten harder and harder to have this kind of generalist expert knowledge, because not only are there more games released every year than ever before, but many of them require an ongoing investment of time. These games are off-limits for me now, at least for a while. Small children take up a lot of time and energy, and it’s not exactly controversial to say that mothers bear the brunt of that in the first year. I played and very much enjoyed Destiny 2’s campaign, for instance, whilst being simultaneously aware that there’s no chance I’d experience any of the raids or end-game fun. I dipped a toe into Horizon: Zero Dawn and Nier: Automata, and loved what I played, but because my time was limited (and I was exhausted most of the time), I had to invest my hours elsewhere. The pace of the gaming conversation I’ve been a part of for my whole adult life, where games are played and dissected and sometimes left behind within weeks or even days of their release, became impractical for me. On the flipside, I have rediscovered the deep and enduring engagement with games that made me fall in love with them as a child and a teenager. Instead of worrying about keeping up with everything, I’ve played a relatively small number of games, but engaged with them deeply. When I was 10 I could only afford about four games a year (plus maybe a couple more for birthday and Christmas presents), and by god, I got them most out of them. Similarly, in 2017 I spent a lot of time with a small number of games that I truly loved—and the rest of my gaming diet comprised things that could be finished in an evening or two, or played on the train. My baby is nearly a toddler now, and I’m regaining a small part of my independent life and my leisure time. I look forward to sampling the rest of 2017’s fantastic games in later years, but the nine games below have accompanied me through the most exhausting and amazing time of my life, and I will always remember them with a special fondness. I was conflicted over Persona 5, because although I loved everything about its super-stylish Tokyo and closely-bonded band of misfit teenagers, it’s also extremely adolescent. I am long past the stage of life when homework,school sports teams and the perceived injustices of the adult world filled my headspace. This year, I sometimes felt faintly ridiculous sitting up at night playing an anime game about fighting monsters and studying. But although Persona 5 doesn’t say anything about the adult world, it doesn’t have to. This is teen fiction, and the escapism it offers for me now is nostalgic: the world is unjust and corrupt, but you and your friends can fight it together, and in between you can while away your time dossing around on the Yamanote line, revising for exams in diners and having intense conversations about life, the universe and everything. I’d love to say that Breath of the Wild is the Zelda game that I’ve been imagining since I first played this series at the age of seven, but that would be giving my imagination too much credit. Breath of the Wild is beyond what I have ever imagined for the Zelda series. The freedom of choice, flexibility and wonderful openness of its world and systems allow for creativity that the traditional strictures of Zelda have never encouraged. Instead of finding the one correct solution to a puzzle, the joy lies in creating your own. And yet the magic at the heart of it is the same magic that animated Link to the Past, Ocarina of Time and all my other favourite Zeldas: Hyrule has a soul, and feels like a real place, full of things and people to discover. 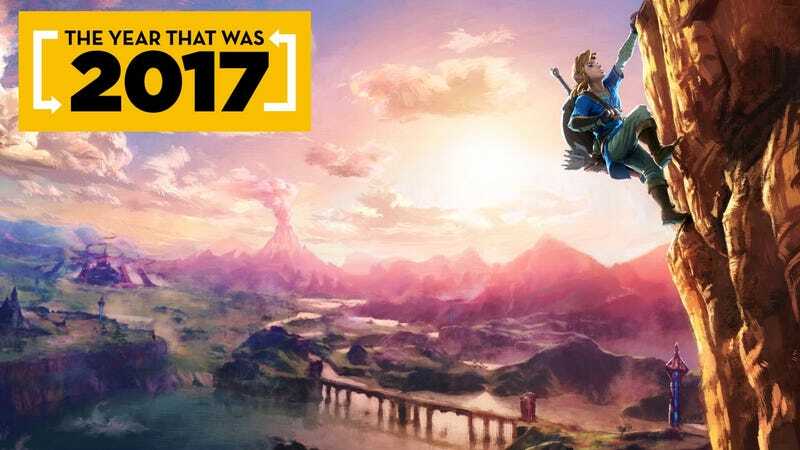 I’ve spent more time with Breath of the Wild than any other game in many years, thanks to the mercifully parent-friendly nature of the Nintendo Switch, and it is the best video game I’ve ever laid hands on. I actually learned to breastfeed lying down so that I could squeeze in extra sessions. Stardew Valley is probably old news for most people reading this, but how could I spend 55 hours on a game and not include it in my top 10? I actually played 40 or so hours of Stardew Valley in the middle of the night when my son was a newborn, but thanks to the wonders of sleep deprivation I remembered almost nothing about it. Rediscovering Stardew Valley on Switch was a delight: it’s such a gentle, friendly game, and though the usual pressures of adversaries and monsters are absent, the rhythms of farm life imbue it with an urgency that makes every harvest day feel a bit like Christmas morning. By the Summer of my second year I was waiting on just two hallowed pieces of produce to complete my Community Center collection—apples and a rabbit’s foot—and the possibility that one of them might turn up any day now kept me up well past my bedtime for much of October this year. A woman returns to her childhood home, the last survivor of an intensely unfortunate family, reliving the short, doomed lives of her relatives. Haunting performances and a beautiful turn of phrase make Edith Finch memorable, but it also surprised me with the way it plays: each story is a different gameplay vignette. Walking through the empty house, you can see the vastness of this game’s inspirations. Copies of Gravity’s Rainbow and Infinite Jest and Swann’s Way line the bookshelves. As a game it borrows the best from Dear Esther and Gone Home in the relaxed pace of its storytelling, the way that curiosity builds to an emotional crescendo, but there also shades of things like Heavy Rain and roguelikes. The stories of Edith’s unfortunate relatives recall 50s pop art, comic books, magical realist literature. It is a learned game, the product of both inspiration and study. It has things to say about birth and death and family mythology that reduced me to an absolute weeping mess, though my emotional defenses have been so low as a new mother this year that I’ve frequently cried at adverts. Here’s a game that I never expected to get into. I enjoyed the original Splatoon, but after a couple of weeks the appeal wore thin. Two things changed this for me: Salmon Run, which is the best cooperative game mode in years, and being able to play it in bed. I became briefly obsessive about Splatoon 2 in the summertime, after an extraordinary 28-win streak in early August had me glued to the Switch, unable to turn the thing off in case I broke my luck. I hadn’t cared that much about a competitive game since Halo 3. Although Splatoon 2 definitely isn’t good for my blood pressure (especially in ranked matches), its colorful and fresh aesthetic—and the absence of the player abuse and toxicity that turns me off most competitive games—kept it light and fun even when I wasn’t doing well. Rainmaker can go to hell, though. I had to swear it off altogether after playing with one too many randomly-selected teammates who dashed backwards instead of forwards, and nearly broke my Switch in half in fury. Dandy Dungeon reconnected me with how I used to play games in a different way: it reminded me very strongly of the strange Japanese games I used to play as a teenager, when I had a PS2, one of those dodgy discs that let you play bootleg games, and a plentiful supply of weed. Developer Onion Games’ Yoshiro Kimura is the mind behind Lack of Love, Rule of Rose and Chulip, three of the oddest and most memorable games of that era, and he is a relic of a time where weird games were plentiful and Japan felt like a promised land of unpredictable game-design creativity. Dandy Dungeon is ostensibly a puzzle-RPG dungeon crawler about a 36-year-old man called Yamada who gets fired from his job making games for a top mobile game developer and resolves to make his own game instead. It’s what happens to Yamada that is most interesting, though. Outside of the dungeon-crawling, you watch him in his apartment, sitting in his computer in his underwear, as strange characters pass through his life. It has themes of failure, social awkwardness and romantic disappointment, but it’s also extremely funny, and feels overwhelmingly personal. What happens inside Yamada’s game is a reflection of what’s happening in his life. Half the music is hummed or sung slightly off-key in a way that reminds me of Katamari Damacy. Dandy Dungeon is the rare mobile game that says something about life. Shout-out to Onion Games’ other bizarre mobile game, Million Onion Hotel, which I have also played for an absurd amount of time and which also delivers a delightful dose of strangeness on top of compulsive mobile-game mechanics. Another game that benefits from authorial vision, Gorogoa was made almost entirely by one person, Jason Roberts, over a period of seven years. Intricate and moving, it is a hand-drawn puzzle game that follows a boy and a monster across time and space, a game of shifting perspectives and creative thinking. It is the antidote to the Twitter age, requiring a calm mood and a contemplative mind. Shifting intricately-drawn panels around on the screen, you turn a sun into a cog to turn a wheel; zoom in on a detail on a book to reveal a man walking endlessly up a mountain, drinking from ladles of spring water; examine statues and stars for clues. Nothing is as it seems in Gorogoa, and the shifts in visual perspective are accompanied by shifts in your mental perspective. A moth becomes an orb, a person becomes an engine, a face becomes a coin. Nothing does what you’d expect it to do, and this is a game that widens your very method of thought. Mario Odyssey might be the most fun video game ever made. It can be broken down into infinitesimal units of fun: each world, each moon, each jump contains joy. Mario is a lovable acrobat whose very movement makes you feel light inside. The richness of Odyssey’s play systems is revealed by how often it can remix the same basic ideas and squeeze new fun out of them each time. The hat-possession element enriches the game with a hundred one-off amusing vignettes, but the running and jumping—flexible, complex, but effortless in the hands of a master—is foundational to Mario Odyssey, as it has been to every Mario game. If Breath of the Wild is about the joy of discovery, Mario is about the joy of movement. For the first half-hour, I didn’t think I was going to like Cuphead. Try-and-die platformers are not amongst my favorite games, and I have even less time to beat my head against brick walls these days. It turned out that I had misunderstood the map and accidentally run straight to the hardest boss available in the first world, Cagney Carnation. This wasn’t a game-ruining mistake. Instead, it showed me early on that even when it seems completely impossible at first, Cuphead is surmountable with persistence and zen-like calm. Like Dark Souls, you don’t realise how much better you’ve gotten until you’re standing on the other side of a victory that seemed impossible just an hour ago. It’s impossible to praise Cuphead without talking about how faithfully it looks and sounds like a classic cartoon, of course, and it is impossible to play it without respecting the immense effort that has been bestowed upon every frame. It is a triumph of craft, and I was delighted to find that it’s so well-constructed underneath its extraordinary exterior.